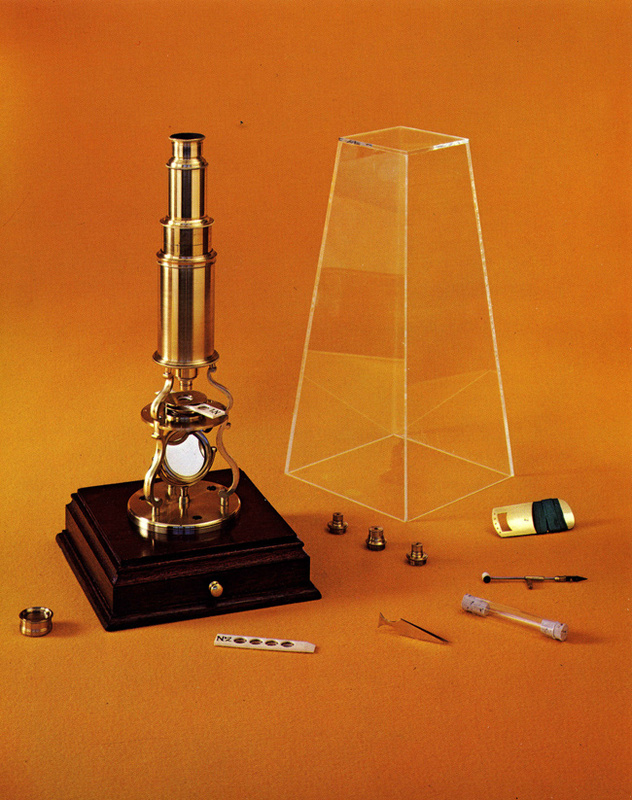 The traditional tripod microscope was popular through the 18th century, and, this design, associated with Culpeper’s name, developed into an all brass instrument during the middle of the century. There are two basic sizes of this type among extant microscopes. The smaller, about 10-11″ tall, is more rare than the larger which is usually about 15-16″ tall. This instrument, often called the apprentice model, is of the smaller (10-11″ tall) model and was reproduced from the original antique microscope #0188 in the McCormick Collection. A circular brass base, 3 1/8" in diameter, is mounted on a hardwood box foot. Two sets of S-curved ornate legs dominate the microscope's physical design. The lower set rises 2 1/2" to support the platform stage. The upper set extends 1 5/8" from the stage to the bottom of the body mounting ring. The stage, 2 1/2" diameter, has a central recessed aperture, a small side aperture, a keyhole, and two substage clips for accessories. A single concave mirror, 1 1/4" diameter, is mounted on gimbal and post in the base center. A brass ring, mounted on the legs, receives the outer body tube, 3 1/3" tall. The draw tube slides into the outer tube. The ocular consists of a 1 3/16" field lens and a doublet eye lens. All three lenses are biconvex. The upper doublet is 9/16" and lower 5/8"; 1/4" separates the the doublets. There are four objectives ranging from low to high power. Coarse adjustment is achieved by means of the draw tube. Accessories consist of two ivory sliders, 1 corked glass tube, brass tweezers, stage forceps with black and white disc, live box, fish plate, and a Bonanni spring stage. A plexiglass covering sits on the hardwood box foot. The closed microscope is 10" tall; 11 5/8" with box case. Objectives are engraved with numbers 1 to 4. The draw tube is also marked with numbers 1 to 4.